A group of 20 elected First Nations councils was expected to present a bid this week for a 22.5% share in TransCanada Corporation’s contentious Coastal GasLink pipeline, which would connect fracked gas fields in Dawson Creek, British Columbia to the massive LNG Canada export terminal in Kitimat. 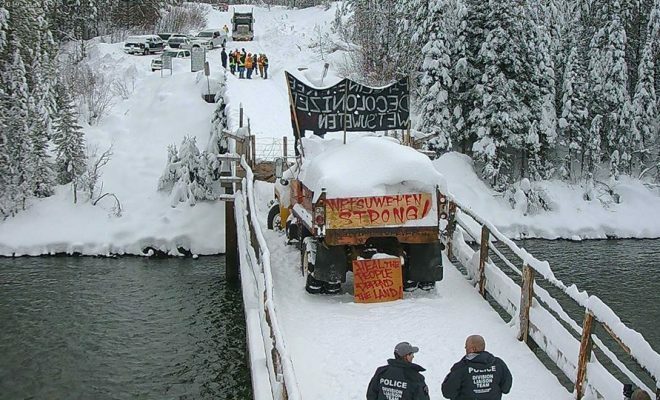 The pipeline route passes through traditional Wet’suwet’en Nation territory where the Unist’ot’en protest camp tried to block construction of a work camp earlier this year. Five of the 20 elected councils in the First Nation Leadership Group (FNLG) are from the Wet’suwet’en Nation, the Globe and Mail reports. “This proposal will not inhibit CGL [Coastal GasLink]’s ability to raise capital for the initial phases of project activities in 2019, and provides a genuine opportunity for the FNLG to explore mutually beneficial partnership and investment opportunities with CGL,” the bands wrote in a letter to TransCanada. Indigenous Peoples are the spiritual guardians of their land, the customary commons. Those that buy into an oil pipeline, therefore, requires that they be excommunicated.